I’ve been ill, and so I’ve been comfort-rereading the Wolves Chronicles. Here is some thinking about one of them in particular. The Stolen Lake is set in an alternate history in which, during the Saxon invasion of Britain, a large community of (Romans and Briton) refugees fled to South America and founded the countries of Hy Brasil, New Cumbria and Lyonesse. This occurred soon after Arthur had left for Avalon; Guinevere was still alive, however, and knowing that Arthur would probably come back over the water had the lake transported in frozen blocks to New Cumbria, so that he would have somewhere to come back to. There … is some stuff going on here. It’s never entirely clear to me what aspects of our world’s history do and don’t make it into Aiken’s alt-histories. Catherine Butler and Hallie O’Donovan (in Reading History in Children’s Books) point out that though it’s tempting to try and find a/the jonbar hinge in the Wolves series and extrapolate what changes might have stemmed from there, it’s all but impossible to do so; that form of alternate history is simply not the framework within which this series operates. I do understand this, and I don’t think this is an attempt to read the book in such terms. But there is, as I say, stuff going on, and I’m particularly interested in trying to parse for myself what it’s doing with regard to my own pet subjects, space and empire. The other books in the series don’t really suggest much is going on with the British empire–the monarchs we see are all benevolent and vague, and things like the East India Company aren’t mentioned. On the other hand, there are trading ships travelling across the world, pirates, and missionaries in China. Meanwhile, British material culture is broadly as you’d expect it to be for the mid/late 19thC. This is all fine; we’re in that familiar space of British children’s literature where the country is small and decent and there is no shortage of tea. But then we leave the British Isles and it gets newer and more interesting. 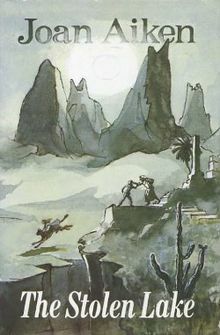 That long ago flight to South America described by this book takes place in 577AD. We’re not sure what it means for (our world’s history of) Spanish and Portugese colonialism, if the Americas are already widely known within Europe and large parts of South America are already essentially a British colony. Several minor characters have names like Jose or Gomez, but this could either signal an Iberian influence that happened anyway or simply be a shorthand for “South American” (since in the world in which the book is written, the Spanish and Portuguese did conquer the region). Scraps of information suggest that the Inca empire has continued in some form into the book’s present (sometime in the mid-19thC), though they don’t come into this book’s plot. It’s also not clear what the racial makeup of the three Roman colonies is–did the original colonists kill most of the natives, intermarry with them, or were the lands just mostly empty, terra nullius except for that one picturesque and unnamed tribe who shrink heads? (Of whom more later.) There are ancient temples on mountains here, but they are dedicated to “Sul” (New Cumbria’s capital is “Aquae Sulis”), who is also somehow Medusa. Hy Brasil (the book’s afterword explains what Hy Brasil was) is ruled by a king named Huascar, son of Huayna Capac, and there is a hint that the country will soon be taken over by Huascar’s brother, Atahuallpa; all pretty much as recorded, just a slightly different empire and three centuries late. Bodily transporting a myth across continents is fraught at the best of times. In Rick Riordan’s Percy Jackson books, for example, we’re told that the Greek gods have moved their centre of operations to New York because America just is the centre of things now, so *shrug*. It’s a piece of imperial thinking that is so basic to the structure of the books that even the increasingly politically aware novels later in the series never quite get away from it. Riordan struggles to navigate this (as does Gaiman in American Gods, from what I remember of it) but I’m not convinced that there’s a way to do it that doesn’t invoke and then validate geopolitical inequalities. In this case, the myth is being transported specifically to a (current) colony, which makes this aspect of the situation even more acute. Then there’s the fact that the Arthur myth itself is one that is inherently about landscape–Arthur territorially binds Britain (see Subramanian, 2017, or just take my word for it that I have a thesis chapter on this), is buried under Britain, will rise to save Britain. It makes sense, then, that the myth can only be relocated by relocating a part of the landscape itself. [That image of individual ice blocks being transported by ship (at some point they must have crossed the equator, I protested) also calls to mind that recurring image, in British children’s literature of the mid-century, of Americans buying up British heritage buildings and relocating them. (I have no idea if this happened often, yet the prevalence of the image has convinced me it did. Wikipedia suggests that there were at least a few prominent instances.)] Unsurprisingly, we discover that Arthur is inscribed upon the local landscape as well–travelling into the mountains the characters see huge geoglyphs that resemble their companion’s birthmark. It’s possible, then, to read Ginevra not only as individually monstrous (though she is), but representative of much that is monstrous about 19th century Britain, a country known for treating its own working class children badly, as well as for consuming and imposing catastrophic change upon other peoples in other places. There’s also, in the image of the grief-stricken queen mourning her lost husband, more than a hint of Victoria (who of course, in Aiken’s world, is never crowned). What, then, of Arthur/Atahuallpa/Gwydion/Holystone? “The whole of Roman America apart from that is in a disgraceful condition of tyranny, anarchy, and misrule. Time it was the High King came back; someone who will be accepted by the people and set matters to rights,” says a friend and ally from a neighbouring kingdom. In one sense, Arthur is as much of an import as Ginevra. But he has been reborn here in South America, has an Inca name (not that we’re told that that’s what “Atahuallpa” is); he is even described as having “pale brown” skin. His followers are eager for him to reunite “Roman America”, and this is in keeping with the character’s British roots (as I’ve said, one of the Arthur myth’s functions is to bind Britain into a single territory), but the idea of a single ruler of possibly divine provenance uniting the empire also runs in tandem with our-world stories about Atahuallpa as the last Sapa Inca. And as for the things that go on in Biru, you’d never believe–brigandage, cannibalism–I believe they even sacrifice their grandmothers to Sul. Grandmothers! in the streets of Manoa you daren’t go out at night because robbers make off with the silver manhole covers; you could fall straight into the sewers and get washed away. And there are those shrunken heads. Almost the only instance of Ginevra embracing anything local is in her fondness for these heads as decorative objects–we’re told also that “Foreign travelers buy many of them; they are one of Cumbria’s principal exports”, wording that does at least implicate those tourists (probably North American and European?) in the continuation of the practice. We know that Arthur, an enlightened monarch, plans to concern himself with “Dissident elements in Hy Brasil … abolish practice of head shrinking … joint action to exterminate the aurocs … improved conditions in the silver mines …”; fair enough, I suppose, but the continued invocation of South America as a space of headshrinking and lawlessness is still uncomfortable. 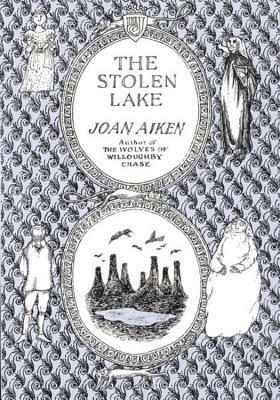 Which is to state the obvious, and say that however much this may be more complex than many British fantasies that unthinkingly appropriate other spaces, The Stolen Lake‘s charming alternate history is of necessity drawing on an imperial vocabulary that means something. Yes, I enjoyed this insightful discussion of some of the basic assumptions underlying The Stolen Lake, though I like to think that Joan Aiken was fully aware of the contradictions in her themes of destiny allied to a Once and Future King, whether despotism is ever essentially benevolent, and how colonialism would link in. Lots of ideas for me to ponder on, thanks! And thanks too for introducing me to Jonbar hinges! Never heard of the term before. I agree that Joan was fluid in her interpretation of when Dido’s world split from ours, from 1832 (or thereabouts) back to 577 here, while in her final Wolves title history is clearly very different from that which we’re used to. I’m about to start my re-exploration of the next Chronicle. If TSL is problematical in terms of cultural issues and complexities of plotting, Limbo Lodge is even more so I feel. As a result I’m a little wary of stepping in before familiarising myself with some of the colonial history of the South Seas. I’m torn on the question of whether Limbo Lodge is inherently more problematic than TSL–there are certainly more opportunities for e.g. descriptions of the Natives that will date badly. On the other hand, it’s definitely more explicit on the nature of colonialism, and presents a form of native resistance that actually *is* native-led and doesn’t rely on white European saviours. But also, I think, part of my reservation is that LL, for all its many issues, does create a fictional island (and it’s doubly fictional in invoking Angria!) whereas TSL, in setting its fictional countries on a real landmass, writes real countries out of existence–which is, of course, a thing that imperial Europe does all the time. I’m very glad to have found your series of posts, by the way! For books so widely read, the Wolves chronicles are seriously under-discussed.